Cookstown Celtic travelled to take on Ambassadors in the quarter final of the Alexandra Cup and progressed to the semis after a hard fought win. The opening exchanges were cagey with both sides struggling to create any clear cut chances. Celtic had Cummings in their goals to thank for keeping them level. He made a great save from a header midway through the half. Celtic had a good chance of their own soon after when Mulligan raced clear but the hosts’ keeper was equal to his effort. Celtic went close through half chances from Maguire and Johnston but neither side could break the deadlock before half time. Celtic started the second half much brighter and were creating half chances but were unable to convert. At the other end the Celtic defence was coping well with the hosts attempts to open the scoring. 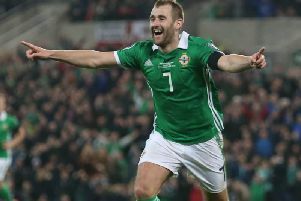 With the game looking destined for extra time Mulligan latched onto a Maguire flick and he made no mistake finishing with his left foot into the bottom corner. The hosts threw everything in search of a late equaliser but couldnt muster a goal. This Saturday Cookstown Celtic host Derryhirk United in league action at the Fairhill at 2.15pm. Cookstown Celtic would like to thank all who supported their Poker Classic night on Saturday in Mulligan’s Bar.